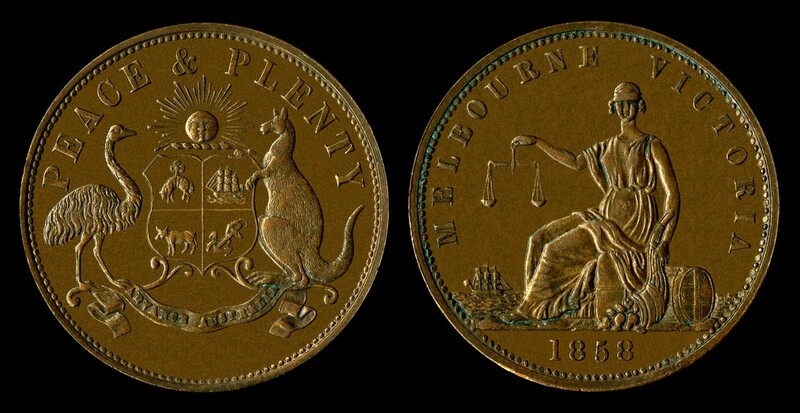 Melbourne in the late 1840s through to the 1860s was affected by a coinage crisis. The crisis mainly related to a shortage of small change in circulation. 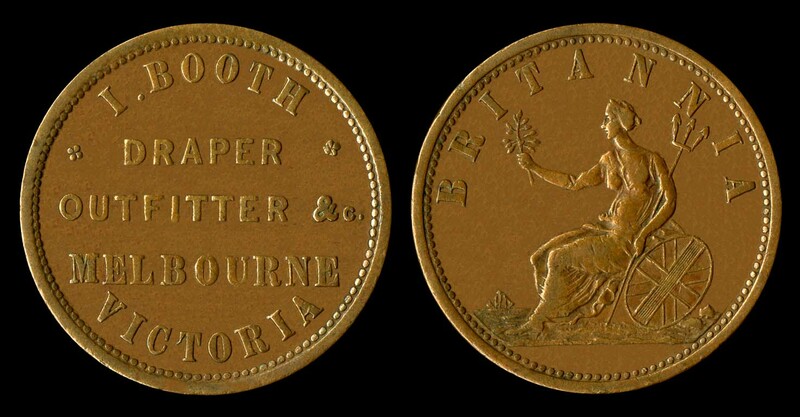 At this time, British coinage was in use, however not enough coins were being supplied for Melbourne’s booming population and economy. Out of necessity, savvy entrepreneurial businesses of the day began issuing trade tokens. These tokens, which were mainly made of copper, were most often the size of a penny or a half penny. The tokens promoted the businesses that produced them, thus providing free advertising and helped to create awareness of their business names within the community. 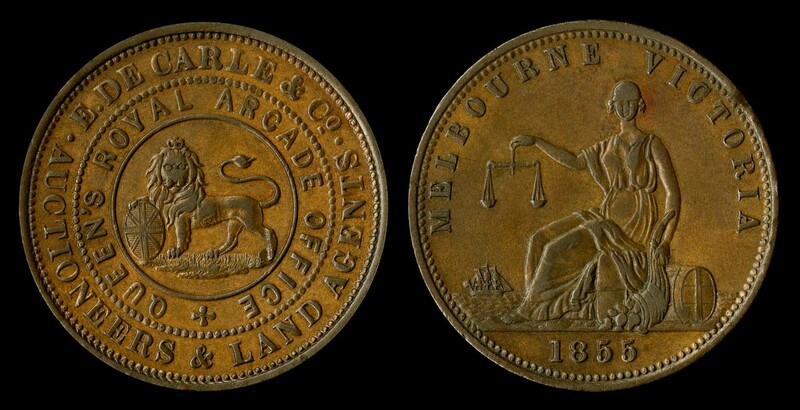 Like the British pennies circulating in Melbourne, tokens often showed the figure of Britannia or symbols of Australia and Melbourne on the reverse side. These unofficial coins proudly promoted the various businesses, such as grocers, drapers and hoteliers, which issued them. While other businesses and clients alike happily accepted them, they were barely tolerated by the government of the day, even though they provided a practical solution to the coinage crisis. 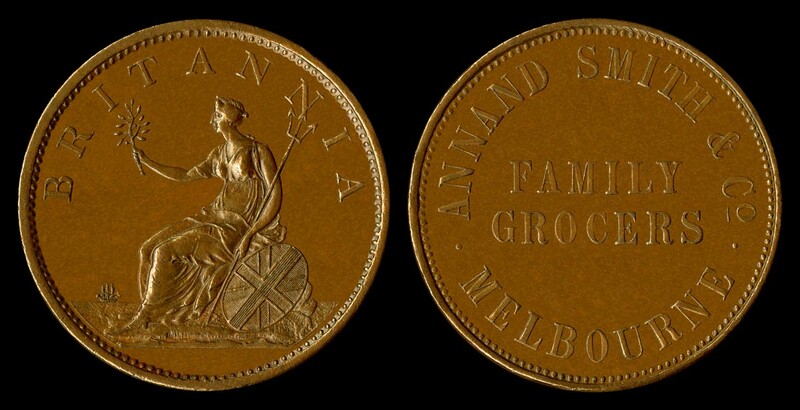 The first tokens that circulated in Melbourne and throughout Australia were imported from Birmingham, England in 1849 by the Collins Street business, Annand, Smith & Co. Family Grocers. The importation of a coinage press and blank pennies in 1854 enabled other businesses to also issue tokens. 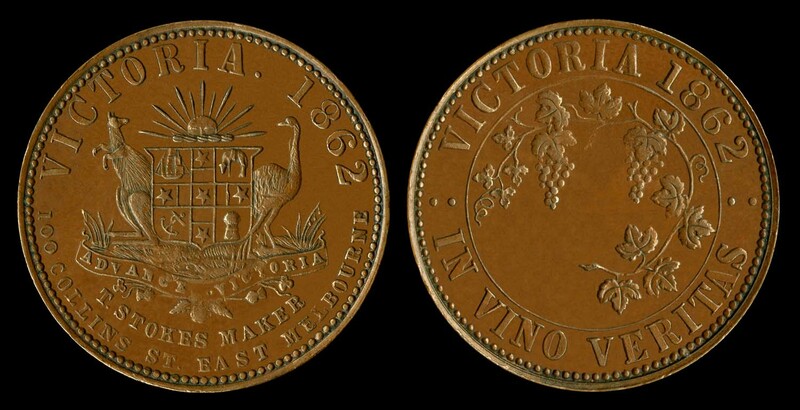 By the late 1860s after enough British pennies had been imported for circulation in Melbourne, tokens were declared illegal in Victoria, but continued to be used elsewhere in Australia. 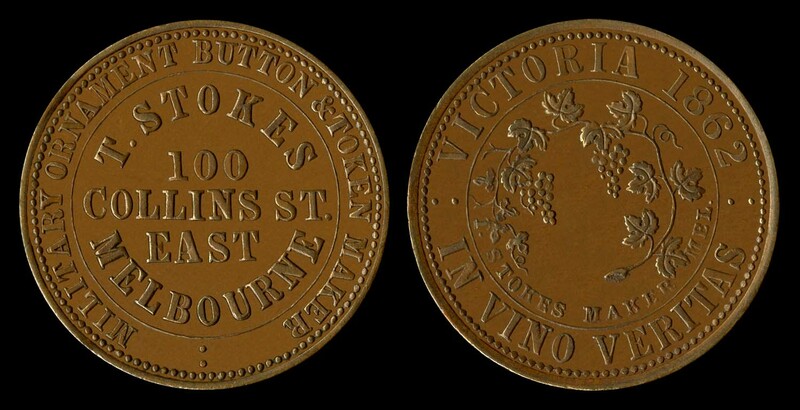 The most prolific issuer and maker of tokens in Melbourne and Australia wide was Thomas Stoke. He was an apprenticed diesinker from Birmingham who arrived in Melbourne in 1854. In the 1860s, his company Thomas Stokes was based at 100 Collins Street East. The business became a proprietary company under the name Stokes & Son Pty Ltd in 1911. In 1962 Stokes became a public company, renamed Stokes (Australasia) Pty Ltd, with offices in Ringwood and throughout Australasia. Today the business is still thriving, making medals/tokens and has become Australia’s major manufacturer of electrical elements and a distributor of appliance spare parts. About twenty years ago, I came across my first Melbourne traders’ token and have been fascinated with these little windows of history ever since. Often I find myself trying to locate addresses on tokens, (difficult since the street numbering has changed in the city), to see what has replaced the savvy little businesses that once issued tokens. 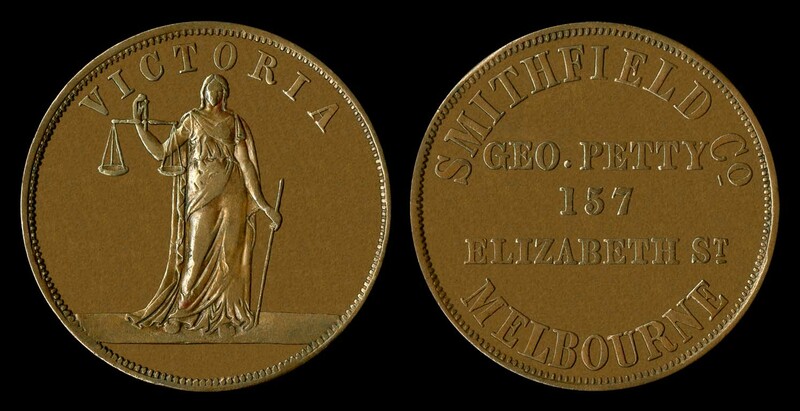 The enhanced photos in this article are of my own collection of Melbourne tokens - click for a larger view. Copper one Penny Token, minted by Heaton & Sons in Birmingham, 1851. Issued by Annand Smith & Co, Family Grocers, in Collins Street, Melbourne. 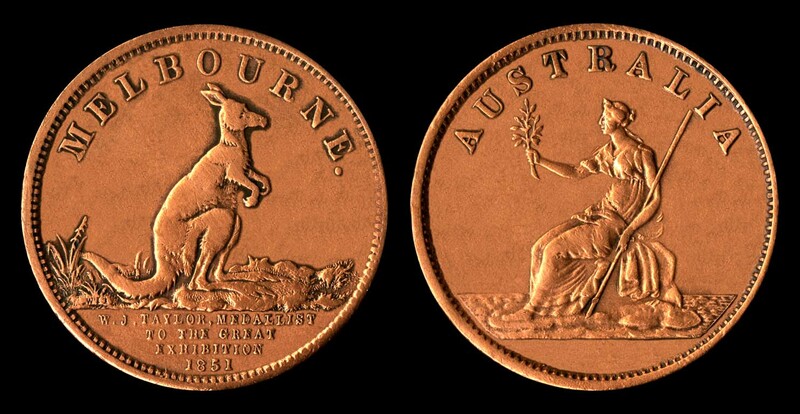 Annand Smith & Co issued Australia's first circulating copper tokens, on 20 October 1849. Edward De Carle is thought to have been in Melbourne from 1849, and is said to have got his start in business by taking goods to the gold fields on a cart pulled by Newfoundland dogs. De Carle was the leading partner in Melbourne’s first shopping arcade, the Queen’s Arcade, in October 1853. Thomas Hide came to Victoria from England. By 1853 he was advertising his services as an auctioneer in Melbourne. In July that year he opened a General store at 11 Bourke Street. A couple of moves later, he is partnership with De Carle and at 68 Elizabeth Street. Copper One Penny Token, minted by Thomas Stokes. 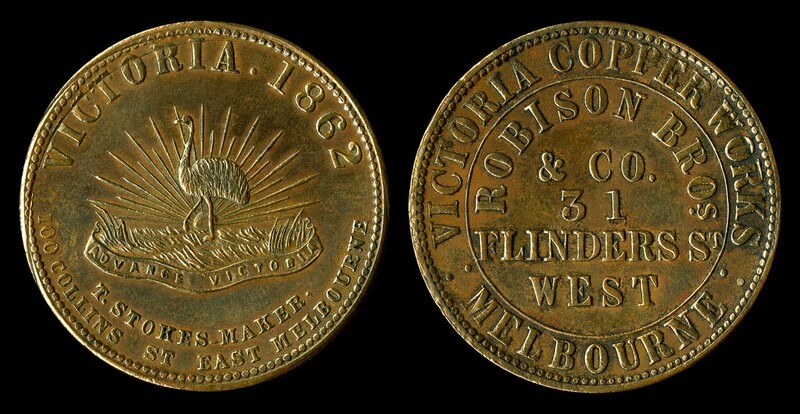 Issued by Robison Bros. & Co, Victoria Copper Works, Melbourne, 1862. William and George Robison founded this company in 1854 and were joined by their brothers over the next nine years. In 1858 William Robison, one of the founders of the company, left to begin his own, competing business. By 1862 the main family firm was listed in Flinders Street. Copper one Penny Token, minted by Thomas Stokes in Melbourne. 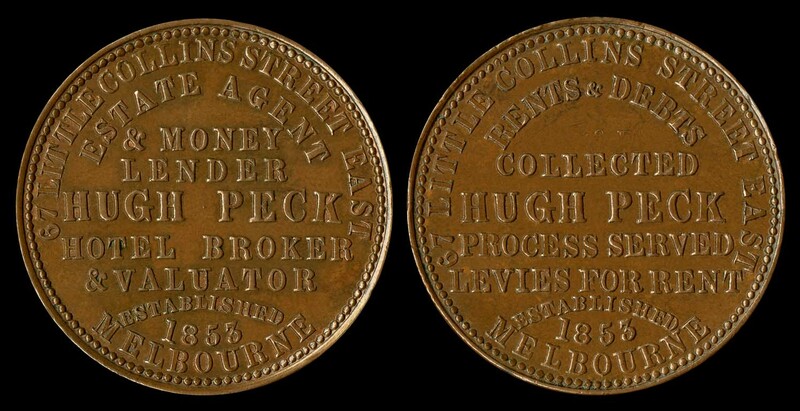 Issued by Hugh Peck, an Estate Agent & Money Lender in Melbourne, circa 1862. Hugh Peck arrived in Victoria in 1852 and established a wholesale hay and corn store in Fitzroy. In 1853 opened a business as 'speculator, auctioneer, and house and land agent' in city. Copper One Penny Token, minted by Pope & Co, Birmingham. Issued by I. Booth & Co, Draper & Outfitter, Melbourne, circa 1853. Isaac Booth lived and kept a draper's shop at 129 Elizabeth Street, in the years 1851 - 1855. 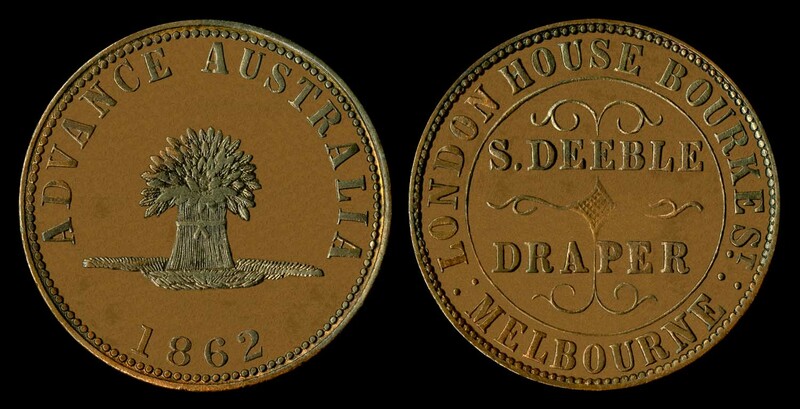 Copper Halfpenny Token, minted by the Kangaroo Office in Melbourne, in 1854. 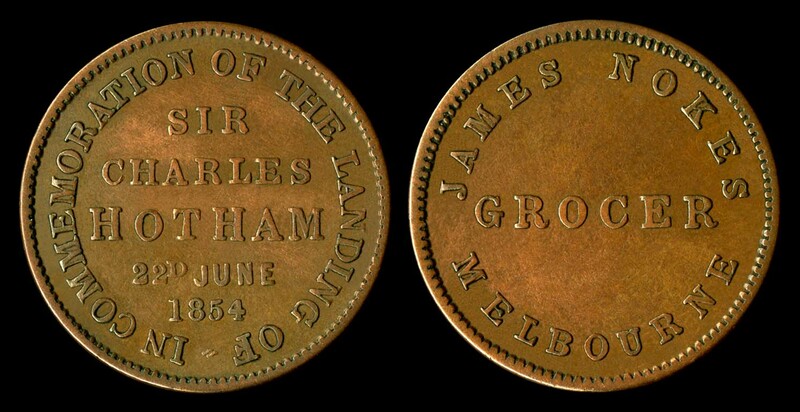 It was issued by James Nokes, a Wholesale and Retail Grocer, to commemorate the arrival of Sir Charles Hotham in Melbourne on 22 June 1854. 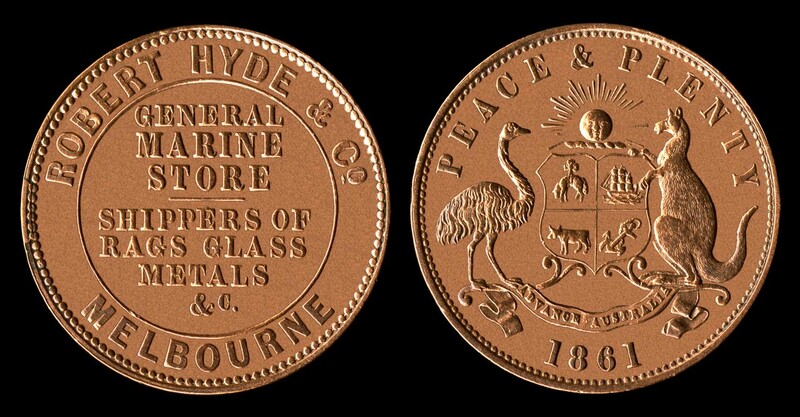 Copper one penny token, minted and issued by Thomas Stokes of Melbourne in 1862. This token is one of the large number of anonymous tokens struck by Stokes late in 1862. This token is one of the many struck by Stokes late in 1862. In vino veritas is a Latin phrase that translates into “in wine [there is the] truth". 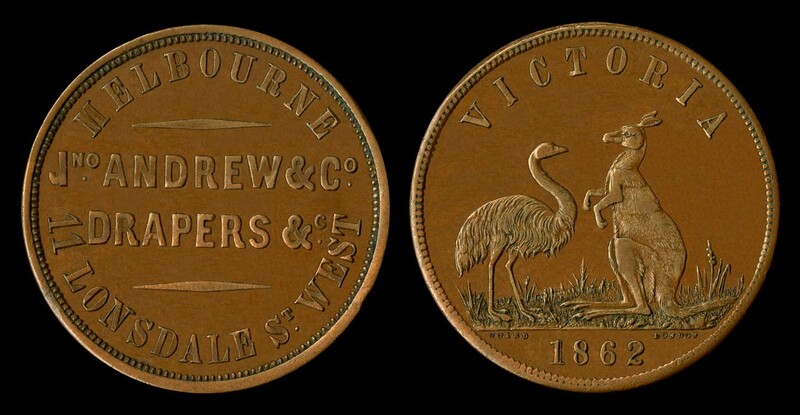 Copper Halfpenny Token, minted and issued by the Kangaroo Office of Melbourne, in 1854. The dies used to strike this token were manufactured by W.J. Taylor in London. 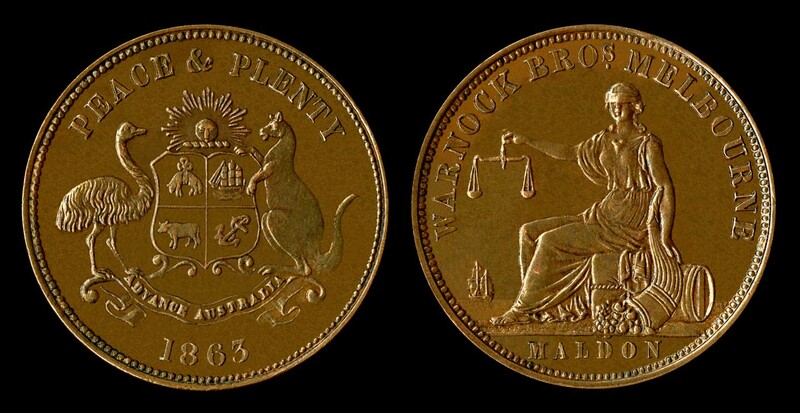 It is a stock halfpenny and features a kangaroo and a seated figure of Australia. Copper One Penny Token, mint agent, Coard, London, minted by W.J. Taylor, London. Issued by John Andrew & Co, Drapers, Melbourne, 1862. John Andrew was apprenticed to the drapery trade in Glasgow and was later successful in his own drapery business in Scotland. He migrated to Australia in 1853. In 1854 he was listed in a Melbourne directory as the owner of a drapery and outfitting business in Lonsdale Street. Copper one Penny Token, minted by Heaton & Sons of Birmingham, circa 1861. Issued by Robert Hyde & Co, Marine Store, Melbourne. Hyde's Marine Store was listed in a Melbourne directory for the first time in 1862. Copper one Penny Token, minted by W.J.Taylor of London, circa 1855. Issued by George Petty of Smithfield & Co, Butchers, Melbourne. Petty is said to have arrived as a boy in Melbourne, coming as a sailor on a ship that brought settlers to Port Phillip. The first trace of him in Melbourne is working in a butcher's shop on Elizabeth Street in 1853. By 1854 he was listed as the owner of a butcher shop in Elizabeth Street, possibly the one he had been working at. Warnock Brothers Token Penny, 1863. Minted by Heaton & Sons, Birmingham. It is very unlikely that any of the tokens of this type saw circulation in Victoria. They were ordered from Britain in 1862 for issue in 1863 but token circulation had ceased before the shipment arrived. Copper One Penny Token, minted by Heaton & Sons, Birmingham, in 1858. This token is part of a large anonymous token issue made by Heaton & Sons employing die hubbing techniques. Copper One Penny Token minted by an unknown British mint. 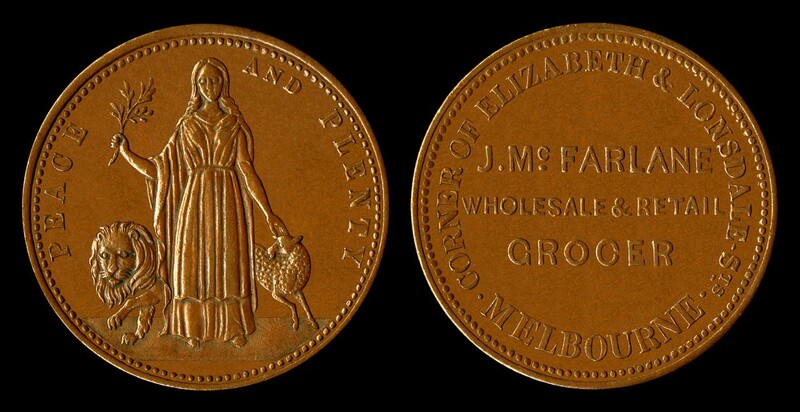 Issued by J. McFarlane, Wholesale & Retail Grocer, in Melbourne, Victoria, circa 1851. McFarlane arrived in Melbourne in 1841 and sent goods to the goldfields during the rushes, in addition to his business in the city. 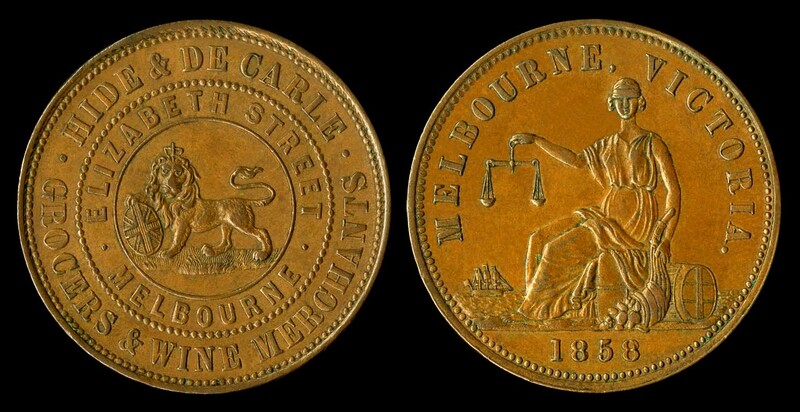 He was probably the second Melbourne merchant to issue tokens. Copper One Penny Token, minted by Thomas Stokes, Melbourne. Issued by S. Deeble, Draper, Melbourne, 1862. Samuel Deeble arrived in Melbourne in 1853. He opened a shop in Melbourne shortly after his arrival. Silvered Medallion/3d token, Cole's Book Arcade Portrait, 1918. 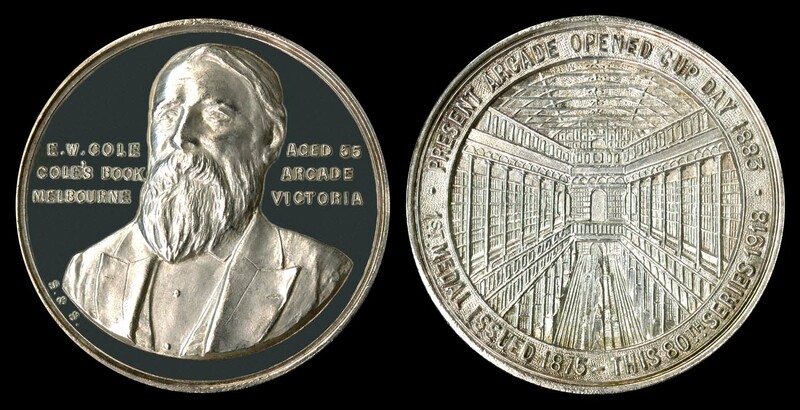 Minted by Stokes & Sons, this silvered commemorative medal depicts the Arcade and provides a portrait of E.W. Cole as he looked when aged 55. All the Cole’s Book Arcade medallions/tokens had monetary value only in his stores. More of Peter every week please! This article was thoroughly an enjoyable read. Who'd knew Melbourne had a coin shortage during the gold rush era.